ANOKA, Minnesota – Federal Premium Ammunition recently announced the recipient of the sixth annual Bill Stevens 4-H Leadership Award. Mr. Gerry Snapp from Missouri was recently honored with the award. He was presented with the recognition by Federal’s Director of Conservation Ryan Bronson at the National 4-H Shooting Sports opening ceremonies June 27th in Nebraska. In 2011, Federal Premium Ammunition created an award to honor those volunteers and professionals involved in the 4-H Shooting Sports Project who have gone the extra mile to achieve the mission of 4-H Shooting Sports. The award is named after the late Bill Stevens, Federal’s former Conservation Programs Manager who retired in 2007 after 42 years. Stevens played a major role in making the Shooting Sports a part of 4-H across the nation. He also increased Federal’s support of the 4-H program. Snapp was selected because of his career of service to the 4-H Shooting Sports Project. In his more than 25 years as an extension educator in Kansas and Missouri he spent over 13 years on the National Shooting Sports Committee, hosted two National Championships and has played a pivotal role launching the Western Heritage discipline in recent years. Federal Premium Ammunition has sponsored 4-H conservation and shooting sports programs for more than 80 years. In addition to sponsoring national competitions, the company was integral in both the formation of 4-H conservation-themed camps in 1934 and the Shooting Sports project in 1976. 4-H Shooting Sports reached over 400,000 children in 2016. Federal Premium has donated more than $440,000 to 4-H Shooting Sports in the last decade, and its lifetime support totals more than $1.2 million. To learn more about 4-H Shooting Sports visit www.4-hshootingsports.org. 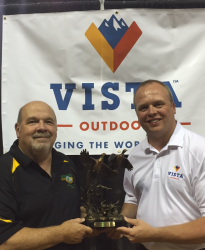 Photo Caption: Gerry Snapp Award Winner from Missouri and Ryan Bronson Director of Conservation for Vista Outdoor.